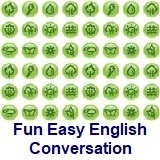 ﻿ Fun Easy English - new classroom free online classes english language lessons speaking listening writing reading may 19. 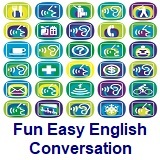 Today in the Fun Easy English classroom you are going to learn about irregular verbs an important part of English grammar. 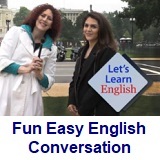 Definition of an irregular verb. 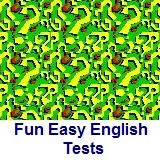 This is one of the most difficult areas of English grammar for students. 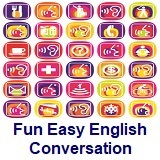 You simply need to keep practicing the different forms of irregular verbs in order to know when to use them. Byron: Did you hear about what happened to Howard? Byron: Someone stole his car! Vance: Really? When did it happen? Byron: Last night. He left it parked in front of his girl friend’s house and when he came out to go home, it was gone. Vance: Wow! That’s really tough. He just bought it last month, didn’t he? Byron: Uh­huh. Fortunately, he’s got insurance and the police think they already have a good lead. Vance: Well, I certainly wish him luck. Exclamation of amazement, surprise, joy, etc.